There has been precious little buying power behind the TrumpSanta rally these last few days, but the selling has been even feebler. 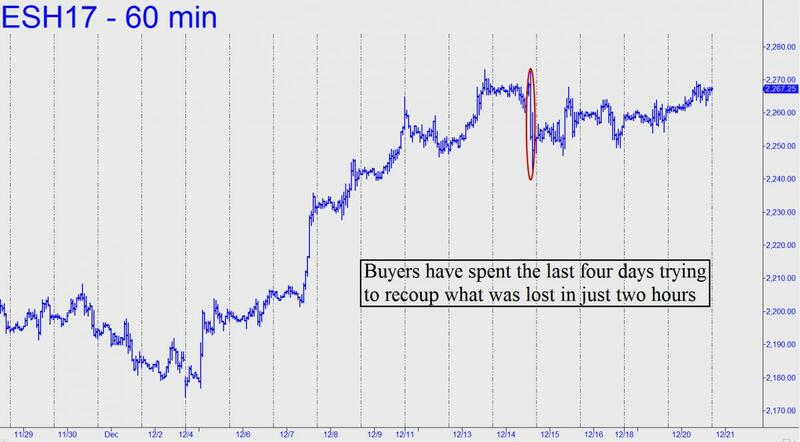 The net result has been a slow, steady waft higher that has not quite recouped what was lost in just two hours of selling on Friday. If you do the math, you can see why bears might be fearful of getting short at these levels. For in fact, they’ve reaped about 50 hours of pain for the two hours of pleasure they may have felt last Friday. Contrarians might see this as reason to take a stand and go opposite the trend. However, I would counsel this approach only for those of you who know how to use ‘camouflage’ to initiate low-risk trades on charts of five-minute degree or less. A big selloff next week seems almost unimaginable in any event, so we’ll plan, simply, on-going with the flow. I have DJIA targets all the way up to 21,101, so the next big trade is likely to involve the purchase of DIA call options. Stay tuned to the chat room and my tout updates if you’re interested. If you don’t subscribe, you can access the chat room and all of Rick's trading 'touts' instantly by clicking here for a no-risk, two-week trial subscription.